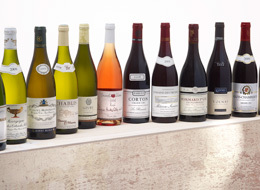 The wines of Bourgogne are classified into 84 Appellations d’Origine Contrôlée (AOCs). From appellations Régionales to Grands Crus, they guarantee the authenticity of the region’s wines. Learn to recognize them – they reflect the diversity of the Bourgogne terroir and the expertise of its winemakers. For many years, the Bourgogne winegrowing region has claimed to have around 100 AOCs. However, there are in fact 84 AOCs. The rest made up by the Dénominations Géographiques Complémentaires (DGCs) within the Bourgogne AOC. Each wine stamped with an AOC is rigorously checked at every stage of its production. In the Bourgogne region, terroir and Climats are intertwined. This jigsaw puzzle, which was born from human patience and observation, reflects the nature of the soil, the arrangement of the various plots in the landscape and history among many other elements. 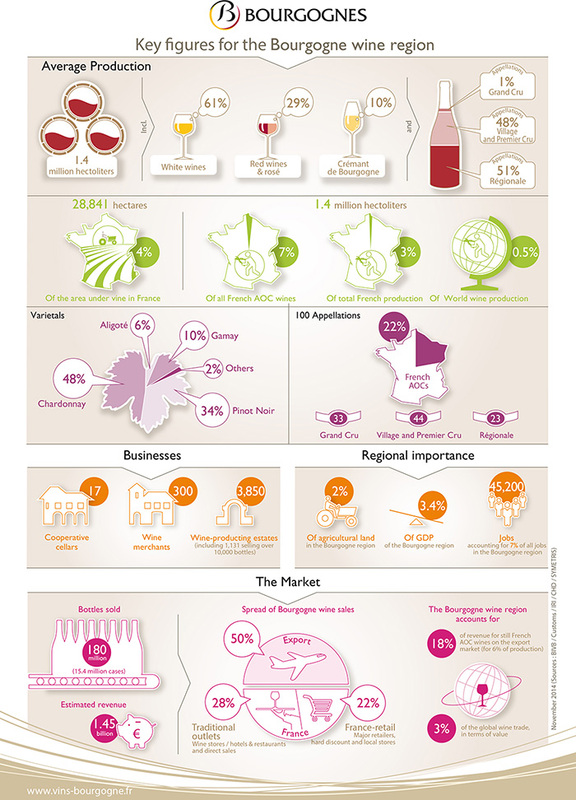 The Bourgogne region is recognized around the world for its prestigious AOCs, with exactly 84 appellations to its name, representing more than 23% of all AOCs attributed to French wines. This exceptional profusion has its roots in the diversity of the natural conditions of the vineyards. As such, there can be slight differences between two neighboring plots, in terms of their aspect and/or soil type. The winegrowers of the Bourgogne region know how to preserve the differences in character brought about by these tiny variations. What is an additional geographical denomination? Some appellation specifications include the mention of an “additional geographical denomination”. These are not separate AOCs, rather the identification of a more restricted areas than that specified in the AOC in which they are included. 1. Additional geographical denominations within the Bourgogne AOC. There are 14 of these, also referred to as “identified” Bourgogne wines. 2. Additional geographical denominations within the Mâcon AOC, including Mâcon Villages wines, and 27 Mâcon + village name wines. 3. 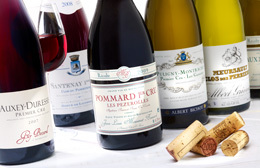 Premier Cru wines, which are wines with an additional geographical denomination noted in the specification of certain Village appellations. 4. There are additional geographical denominations in two Grand Cru appellations: Chablis Grand Cru and Corton. Bourgogne Aligoté, Mâcon Villages, Coteaux Bourguignons, Crémant de Bourgogne – these are just a few of the 7 appellations Régionales produced across the Bourgogne winegrowing region. 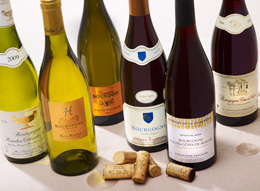 These wines offer an excellent entry point into the world of Bourgogne wines and are perfect for enjoying between friends. The 44 appellations Village take their names from the commune where their grapes were grown, such as Mercurey, Pommard, and Nuits-Saint-Georges. Discover them on the estate or at home. 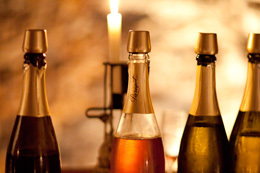 They will enable you to explore all the diversity of the wines of Bourgogne. These wines are produced from single plots, which are precisely defined within an appellation Village. These plots are known as Climats. On the bottle, the name of the commune is followed by the name of the plot where the grapes were grown, such as Chablis Premier Cru, Montée de Tonnerre for example. The Climats are anything but a marketing tool. They are a physical and sensorial reality. Taste their wines to truly grasp all their elegant flavors. 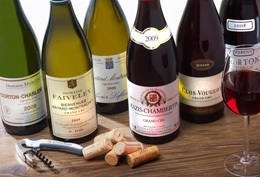 These 33 world-renowned Grand Cru wines of Bourgogne express the unique characteristics of some exceptional plots. On their labels, the name of the village is replaced by a single Climat name such as Corton, Montrachet, Romanée Saint-Vivant or Clos de Tart. Synonymous with sophistication and uniqueness, these appellations Grands Crus are to be enjoyed on exceptional occasions.